Isadora Moon is special because she's different. Her mum is a fairy and her dad is a vampire and she's a bit of both. When Isadora is invited to stay at her friend Zoe's house she's so excited - she hasn't been to a sleepover before! And with a touch of Isadora magic, this is goi... read full description below. Isadora Moon is special because she's different. Her mum is a fairy and her dad is a vampire and she's a bit of both. When Isadora is invited to stay at her friend Zoe's house she's so excited - she hasn't been to a sleepover before! There will be midnight feasts, and staying up all night, it's going to be so much fun! And while she's there, Isadora and Zoe are going to work on their cake for a baking competition at school. But will they be able to resist adding a sprinkling of magic to their creation. . . ? With irresistible pink and black artwork throughout by author/illustrator Harriet Muncaster and a totally unique heroine with an out-of-this-world family, this is a beautiful, charming, and funny series of first chapter books. 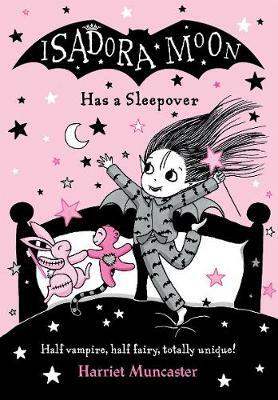 Perfect for fans of Claude, Dixie O'Day, and Squishy McFluff, Isadora Moon is the ideal choice for readers who want their magic and sparkle with a bit of bite! Harriet is a graduate of the Cambridge MA in Children's Illustration, and is the illustrator of Parragon's Glitterbelle books, as well as her own I Am a Witch's Cat, and Happy Halloween, Witch's Cat!, published by Harper Collins in the US. 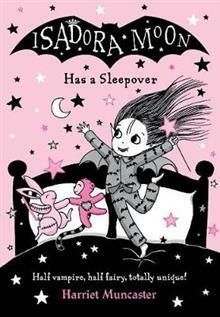 And, of course, she is the author and illustrator of the magical Isadora Moon series! She loves anything teeny tiny, anything starry, and everything glittery.